In this 'purple' colored plant contains several health benefits, such as; one of the brain food, rich in Phenolic Antioxidant Compounds & also cardiovascular health and Free Radical Protection. 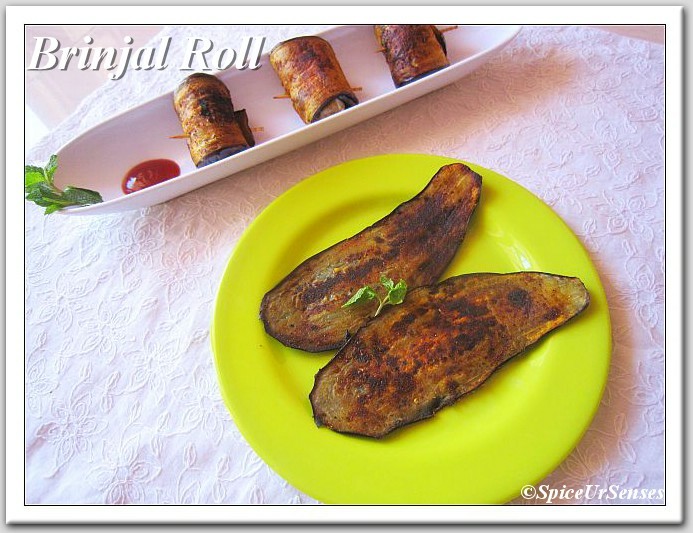 It is a very simple yet classy veg recipe of brinjal. 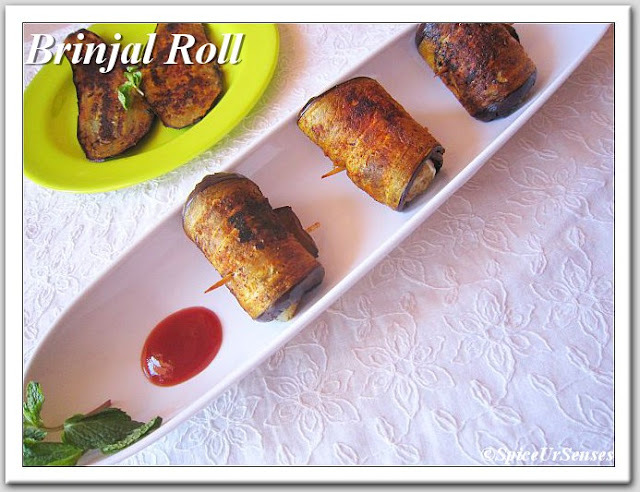 During winter season brinjal is a hot favorite vegetable in almost every household. These delicious rolls are perfect for parties and holidays. In a bowl mash the potatoes, now add all the ingredients with it , mix it nicely , In a frying pan add 2tsp oil and half fry the brinjal slice both the side. Then take a mixture make a small balls and keep the balls in the fried brinjal slice and roll it up and close with tooth pick. Then add a 2tsp of oil in frying pan and fry the brinjal rolls to golden brown. Garnish the coriander leaves and. Serve hot with tomato sauce. Beautiful rolls, prefect for starters.. 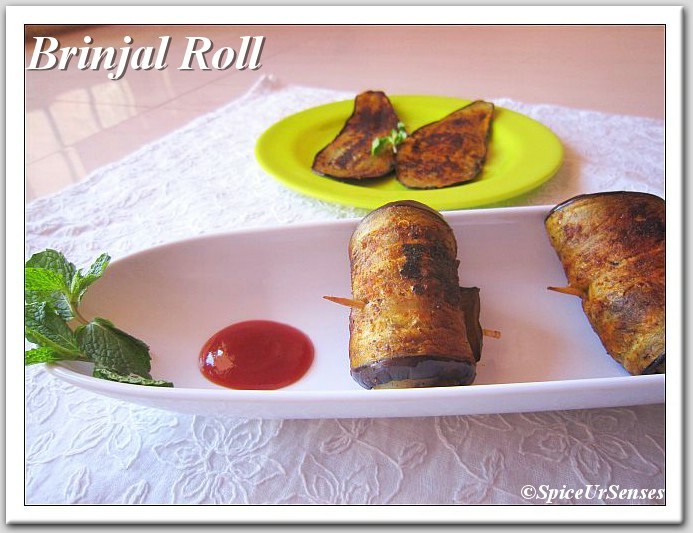 Very lovely way to use Brinjal, looks delicious! Excellent Rumana. I am def gonna try this..
Rumana I loved the way you have rolled the egg plant here. Looks so attractive. So perfect rolls !! yummy and delicious !! Very attractive eggplant rolls and well presented Rumana.. Very attractive rolls..the clicks are real awesome! Perfect looking rolls.So beautifully done.Can I have one please. Wow very different recipe love the rolls, nice photography..
Wow so delicious and tempting rolls..
absolutely brilliant and so innovative! 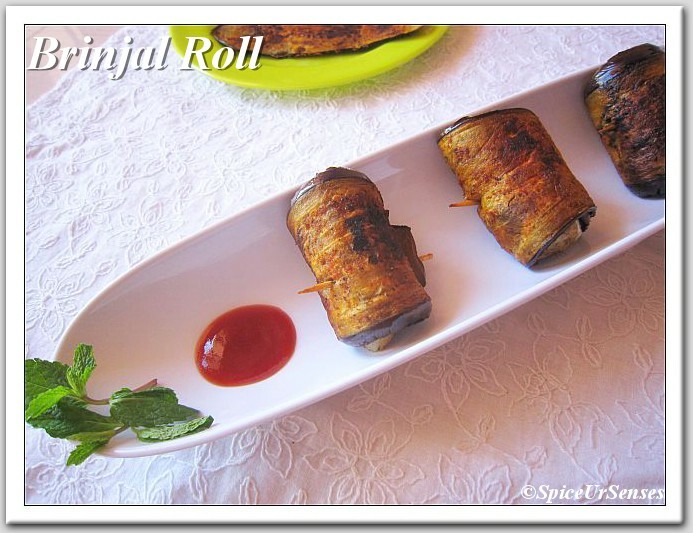 Brinjal roll looks awesome delicious Rumana. eggplant roll looks great and delicious..lovely presentation! I love eggplant and this dish looks like something I would really enjoy! (Your pictures are wonderful) thanks for sharing this with us at the Hearth and Soul Hop! This is very innovative. It's simple and yet classy :) Thanks a lot for sharing this with Hearth and Soul Hop. Please come back next week to link your dish ! very good post and looks very yummy. These are my post links on indiblogger- http://www.indiblogger.in/indipost.php?post=91580 , http://www.indiblogger.in/indipost.php?post=94391 , http://www.indiblogger.in/indipost.php?post=94385 .please click the links to view and comment for my posts .to promote them , return back to the links and click on promote the post..
hope that u will promote my posts.